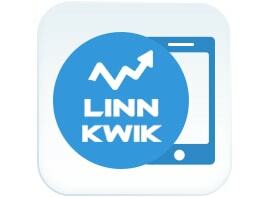 With LinnKwik, your business is never any further than the smartphone in your pocket. Powerful, intuitive reporting tools let you see the orders your team are processing, as well as channel sales and product sales figures. Customise reports to get a clearer view of your sales, and identify strengths and weaknesses your team may have missed. LinnKwik is designed to assist online sellers using Linnworks in keeping an eye on the performance of their business wherever they are. It gives you access to powerful and intuitive reporting and analysis tools to help you identify strengths and weaknesses, allowing you to target weak areas for attention and reinforce areas of strength. It offers a range of customisation options, allowing each user to tailor it to their requirements when evaluating the data about their business. The user must login before entering the application. Tick Remember Me if this is a device only you use, and it will remember your login details after exiting. If the user hasn’t generated a Linnworks token, then they will be redirected to the below page and can generate a token using the Generate Token button. Click Submit to apply the token. Only then can you use the application. Once the initial connection is in place, you’ll need to register for the application. On the registration page, you should enter your Company Name, Registered Email and Password to sign up for a subscription. This report analyses your daily sales performance. This report offers you details relating to the Total number of paid orders received by Linnworks for a given period. This period can be Today, the last 7 days or the last 30 days. This reviews open and processed orders received. Fields shown are Order Number, Order Status, Source, SubSource, Order Date and Order Items. This screen allows you to review the content and details of a selected order. This shows detailed order information for a channel selected for further information in Top Selling Channels. Details can be represented graphically. This report reviews and summarises product sales for a given period. It reviews these results in figures or graphically. Periods covered are: Today, the last 7 days and the last 30 days. User can see the total number of transactions that have occurred in terms of sales, cancellation, exchange and refund. Tap a result for more details. This report covers transaction activity: Sales, Cancellations, Exchanges and Refunds. This report is a detailed breakdown of the information from the Total Number of Transactions report above. This report covers the specified period, detailing the average numbers of products sold and the average transaction value, including a graph. Tapping an entry returns more details. This shows the results selected in the Average Products and Average Transactions report above in more detail.